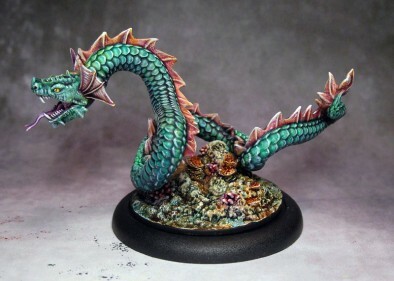 Not only do the resin minis for Deep Wars from Antimatter Games look fantastic, they look incredible when painted up! The Nereids use many warbeasts to cleanse invaders from their reef home, including the deadly Sea Serpents, ancient creatures related to ethereal dragons and revered by the sorcerers of Xibalba, who used their blood when creating the Nereids. They are fast and covered in thick scales, making them difficult to take down but they are most feared for their sharp fangs and highly toxic venom. What do you think of this lovely Sea Serpent? 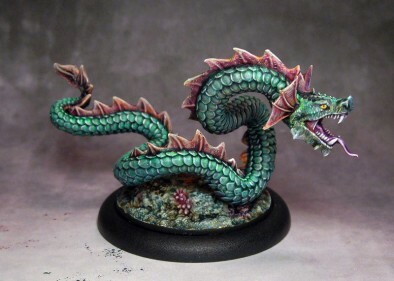 "They are fast and covered in thick scales, making them difficult to take down but they are most feared for their sharp fangs and highly toxic venom..."
That is really nice looking sea serpent. a great looking water sake.